The joys and benefits of backyard gardening are too many to mention here. That is probably why in Hamilton County (and around the U.S.), more people are feeling the itch to get their hands dirty. The Hamilton County Soil and Water Conservation District supports backyard gardens not only because of the personal benefits but also because of its contribution to improving environmental health. A backyard garden increases diversity, attracts beneficial insects, and creates habitat - in Hamilton County, which experiences habitat loss due to development, this is especially important. If you already have a garden and want to learn more, visit our Garden Resources page where you can find numerous resources that may point you in the right direction. Start small and simple. If you plan to use the full garden season (March through October), you can expect to spend 1.5 to 3 hours for each 35 to 50 square feet of garden per week. Many beginning gardeners have high hopes but become frustrated when they can't keep up with the weeds. For vegetables to grow well, they need at a minimum, 6 hours of direct sunlight; perferably during the 9am to 3pm portion of the day assuming adequate watering and temperatures. Other vegetables, like greens, can tolerate less sunlight. An ideal site is level and drains well. A site that dips a little is okay as long as it doesn't flood and drains well. In Hamilton County, with typical soils, however, this is not likely. A site that is level and sits at or slighly above the surrounding terrain is ideal. 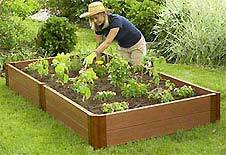 If you plan to build a raised bed (click here to learn more on whether or not you should), you may be able to bypass some more difficult areas. Will the site have good access to water? Will you install a rain barrel? Having good access to water will make your gardening work much easier. Before selecting your site, it is a good idea to examine and test the soil. If you plan to do an in-ground bed (as opposed to a raised bed), this is especially important to determine if the soil has the capacity to meet your expectations. Many soils in urban areas, especially around developments, have been poorly treated, compacted, and disturbed. A soil test and site visit will determine if certain applications of nutrients or organic matter would be beneficial. Whether you plan to use a raised bed or plant in ground, design a garden space that maximizes the space yet has plenty of room to move around and access your garden beds. To maximize space and accessability, a technique called keyhole gardening may be helpful. Other designs like row cropping or 4x8 plots are common as well. Consider accessability by making the plots narrower (e.g. 3 feet deep) to facilitate access. Use edges when possible. Either through tilling, sod removal, herbicide application, or solarization, you will need to remove the existing vegetation to get started. With raised beds (Tech Sheet: Components of Raised Beds), you may want to place weed barrier or wire cloth at the base to prevent weeds and moles from creeping into your bed. Another type of garden called Lasagna Gardening may be appropriate for your site, too. Plants have unique needs depending on their size and nutrient requirements. Looking on the back of your seed packet or learning online about the vegetables you plan to grow is helpful in determining the amount of space, light, and watering needs a plant requires. Once you know these characteristics, create a garden planting plan (this can be as simple and as complex as you like) to ensure you use your space wisely.